I just go Bodacious Bouquet yesterday, it's a lot of fun. Here are the cards I've made so far. The first card was for the Technique Challenge, which was to use words or letters for your background. I used the letters from friends to make the background. I also used ribbon, a jump ring, and some shrink plastic on here (to make the little flower charm). I love making my own charms with that stuff! 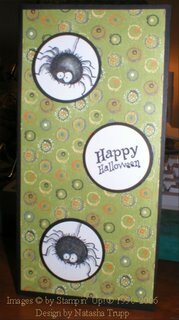 The other card was for the Colour Challenge, which was to use the colours olive, chocolate, and pumpkin (hungry yet?). I was feeling a retro vibe to those colours, so I went with that. Tamara said that i t reminded her of Aunt Carol's basement floor. After she said that I totally agree! I titled this card 70s Kitchen. 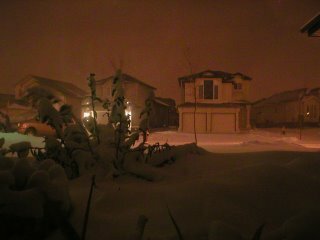 For 12:00 to roll around, here is a photo of our winter "storm". 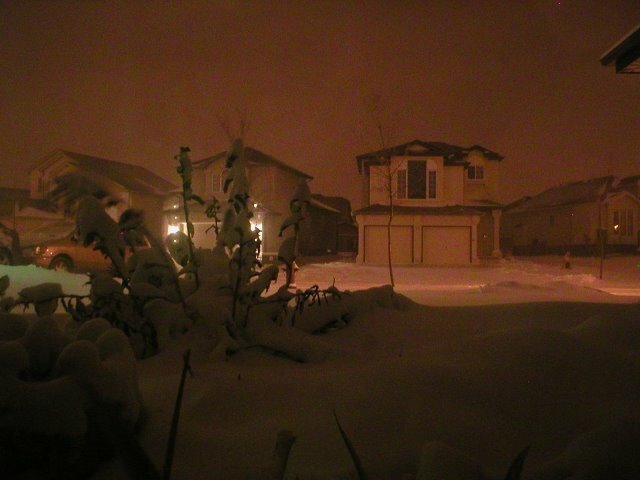 I'm guessing the final snow total was about 15cm (around 6 inches). It's actually quite nice out, but driving what indeed trechorous. I didn't need to use my gas pedal at all, was coasting the whole way home from work. Okay!! I have a winner, using my random number generator, I have ome to the number 25. 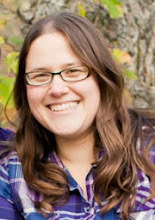 After multiple counting, and a 2nd pair of eyes, I have verified that the winner is Michelle Nadraszky! Michelle please email me here with your mailing address! There's a winter storm watch/warning today, boo! (Actually, I don't mind winter, I just don't like driving in near zero conditions). So what's the best way to beat gloom? Make cards using orange! 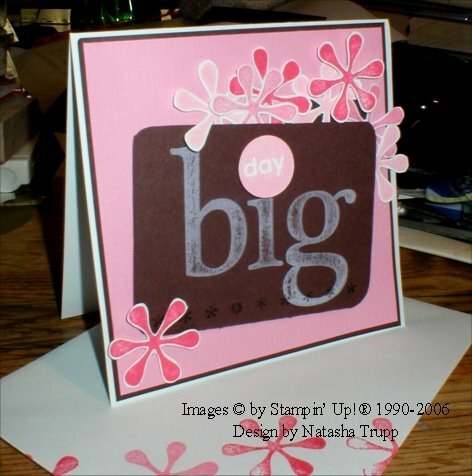 One thing I really love about stamping and cardmaking is the fact that you can completely copy a layout of another card, yet the creation is totally your own. In the new winter mini, there are these adorable "love notes". I thought the layouts were so cute, so I put my own twist on them. Instead of making 3x3 valentines, I made 3x3 friendship cards. 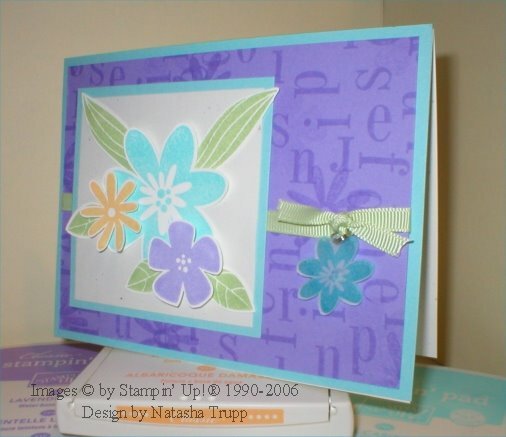 I used the flowers from the retired Little Layers Plus and the double-sided paper from Four Seasons. I also had fun setting the scene for my picture. You know when a television station goes off the air? Well that is the look I was going for here. I just wanted to make a fun and simple card. I have no idea what I will use this card for. The sentiment is highly entertaining. Maybe send it to someone who's had a rough week? 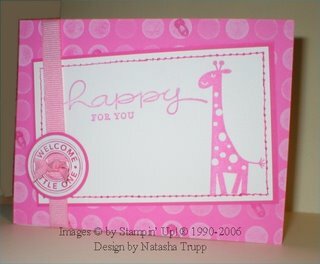 My friends seriously need to start getting married and having kids, because I love making baby cards! 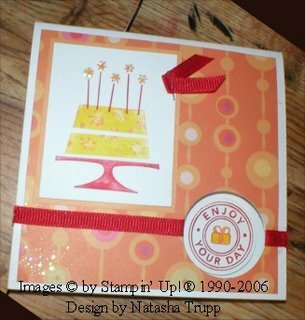 While I was designing this card at work this morning, I thought that the little shapes from Riveting would fit nicely into the circles on the Dotted background stamp. I got home and started, and guess what! They do! So, if you're looking to jazz up the Dotted background, the Riveting shapes are a perfect fit! 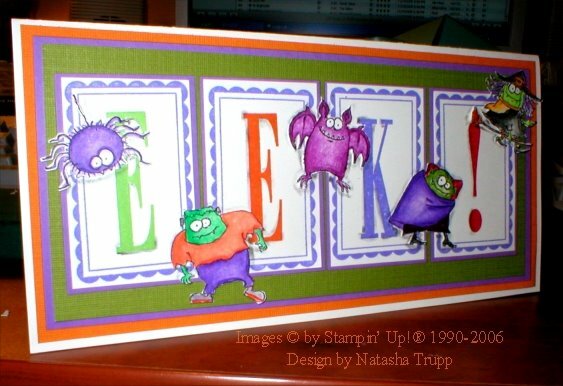 I do recommend using a stamp-a-ma-jig and markers however. This card also has some faux stitching, and I dyed the ribbon with reinkers, since I didn't have any nice pink grosgrain. 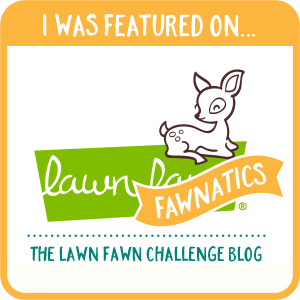 Well, as we all know, blog contests are quite popular. I recently passed the 5,000 view landmark, so I figured, why not join in the give away fun. 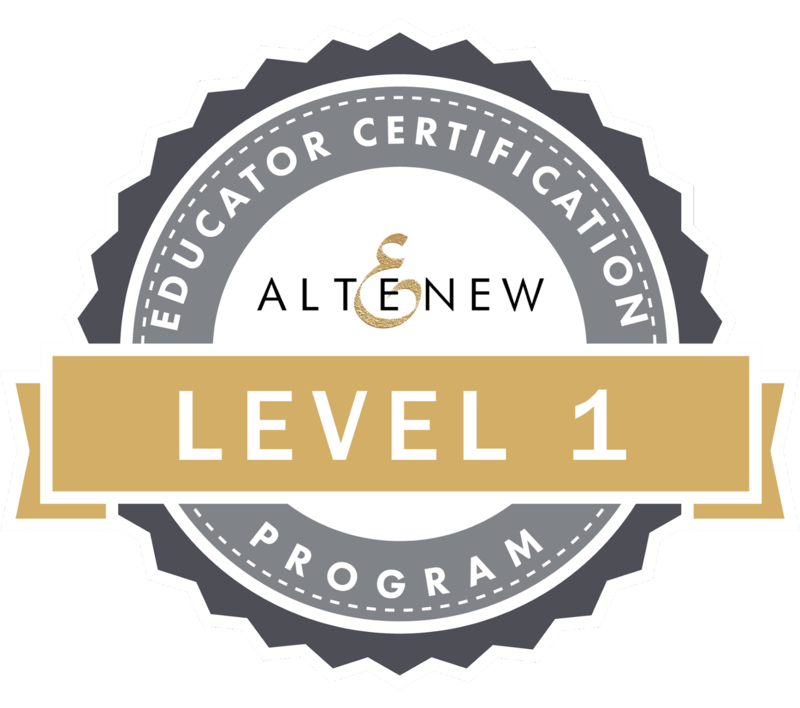 In order to be eligible, you must comment on this post. So, what's the prize you ask?? 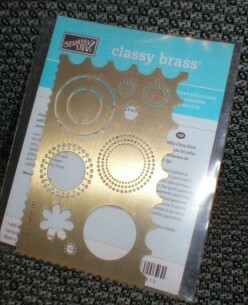 Well, it's a Seeing Spots Classy Brass template. 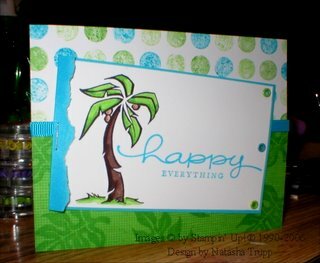 Dry embossing is loads of fun, and if you haven't tried it yet, I encourage you to. It really adds that extra little wow factor to your card. I will choose the winner randomly on October 31st at midnight my time (so that's the early morning of Halloween). Good luck! Edited to add... Just in case you weren't convinced over brassy templates, here's a card I just made using the seeing spots template (I've got 2, that's why I'm giving one away!) This card was made for the Thursday and Friday challenge at SCS. The Thursday one was to use a stencil, the Friday one was to be TGIF related. Nothing says the weekend like vibrant colours and sharing a smile! Here's my second sketch challenge card. It's amazing how different the same layout can look. I saw a lot of cool little touches some other artists had put on their cards, so I wanted to use what I had seen. I liked the look of doodled big letters, so I modified mine with faux stitches. I also liked the look of the tabbed sentiment. I haven't done this in a while, so I decided to add that. I also saw someone use the key tag punch as a neat little side tab with a button, so I also included that. The result? A plethora of Christmas colour and patterns. I hope you enjoy, I certainly had a good time making it. Stamp sets used are Glad Tidings, Snow Flurries, Linograph, and Making Memories Jersey Foam Alphabet. 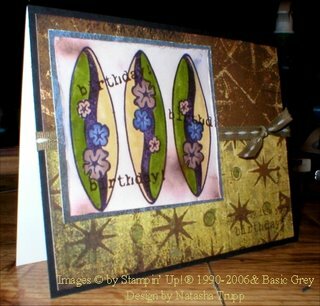 This card was made using the Wednesday sketch challenge at SCS. I had it all finished, but wasn't too impressed. So then I thought, what does it need? It needs stitching!! Well, let me tell you, this was not an easy task. I have a vellum layer overtop to lighten the background. Vellum tears really easily when you try to stitch along its edges. I pierced the paper first, but then as I was sewing, I realized that I had gone way too close to the edges, the thread wouldn't stay stitched, disaster!! So I took the whole thing apart, salvaged all I could ( I only had to replace the vellum and the cocoa paper), then remade it, stitching farther away from the edge. Of course the hand sewing didn't go well. The thread loop kept getting caught on the corners, and I would get spontaneous knotting now and then, but finally, it's done. I really believe that the stitching adds to it. I love the look of the little file folder shape, but I was struggling with finding a way to make it look good on a cardfront. I had drawn this sketch at work yesterday, with the intention of filling the folder with hearts, but then my freebie set came a day early (woot! ), so I had to use that instead. I stamped All in a Row on the bottom of the folder, as well as on the tab (which is barely visible). I also used quite a few pop dots here, the day is raised up, as is the bottom asterisk, and the upper rightmost asterisk. 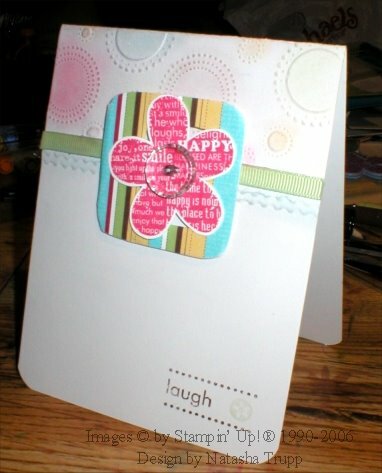 These 3x6 cards are great for a quick and simple card. It's nice, one 12x12 sheet of paper makes 4 cards with no strange maneuvering or creative cutting. 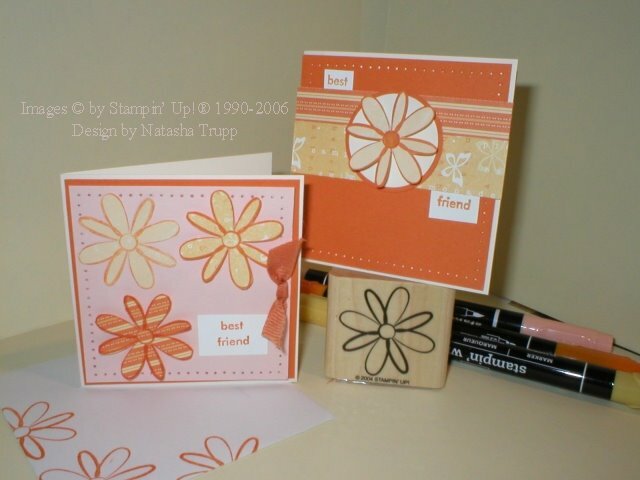 Choosing a small image stamp set and have the 2 larger circle punches also help for making super quick cards. The longest part was the colouring, but since I used only one colour, and a little bit of gamsol, this too went quickly. It's just nice to actually prove to yourself that you can make an alright card under 10 minutes. I apparently I was in the mood of torturing my hands tonight. My sister sent me some of the stamped images from "Booglie Eyes", so the only way to use them nicely is to cut them out. Luckily, since I have been taking an unwanted hiatus from the stamping, I could actually cut out all those little guys without even hurting my hands! (Excessive cutting had been hurting a few weeks ago). Anyway, this card is quite large, about 8x4. The Booglies were coloured in using prismacolors, gamsol, and stumps. Then I cut them out, and placed them over the letters and labels and added a bit more shading around the letters and booglies. For this type of layout, I actually recommend cutting out the coloured images in place of masking. Looking at it, I think it would've taken way longer, and been way more frustrating to try and mask the letters. If you cut out the images, you can see where they look best. It's nice to have that flexibility. The scalloped edges picture guide is up here: http://palm-pogo-lessons.blogspot.com/. I hope it helps! I kept modifying, and re-modifying the design I wanted to do for my swaps, but I just wasn't happy. So I went with a good stand-by layout (haha, look familiar...) that could still showcase the corner rounder scalloping technique. It makes me feel pretty pathetic though, it takes me just as long to make 4 cards, as it does to make 1, go figure... Maybe I should start making things in fours. 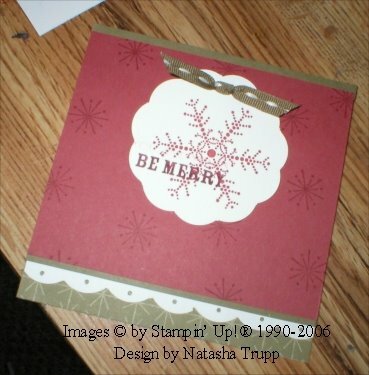 This card uses The Snowflake Spot, Glad Tidings, and the Dotted background, as well as some fun Holiday Mini goodies (the patterned paper, and the stitched ribbon), and glitter!! So here's a sympathy card. These types of cards aren't the funnest items to make. They are also not the easiest. You don't want to choose the colours, the wrong images, or too many embellishments. Fortunately, this was a commissioned sympathy card, and not one for personal. 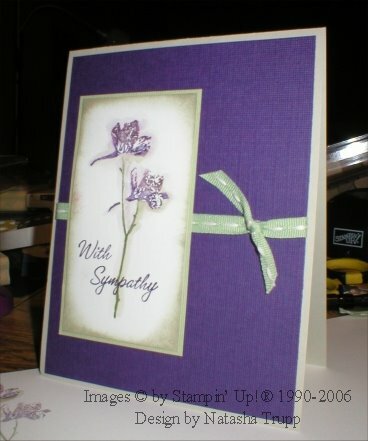 My grandmother phoned requesting one for a friend of hers (although on the message, she stated she needed a birthday card, so imagine my surprise when I called her back asking for details about the recipient and I was given the information that this wasn't to be a birthday card, but a sympathy card. Wow, how quickly that changes your mindset). So here it is, I pulled out a retired favorite. These flowers work well for somber events. I used textured cardstock because it adds to the card without being overwhelming. Here's some more cards using the corner rounder as a scallop punch. 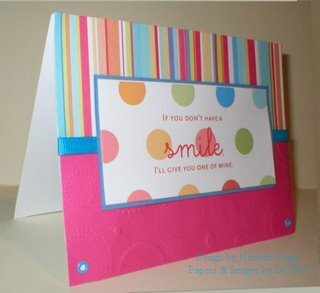 The circles and the bottom edge both use the corner rounder. I just wanted to make something simple, yet classy, so this is what I came up with. In the top corner of the photo an inset of the inside of the card, I continued the scalloped theme in there. 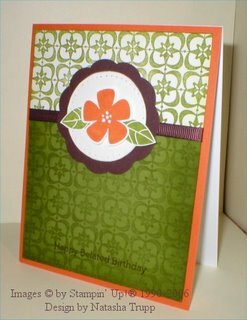 I love the look of all those scalloped circles that are ever-growing in popularity. I have not seen any of those punches available for purchase locally, so what do I do? Try to get the look using what I've already got! 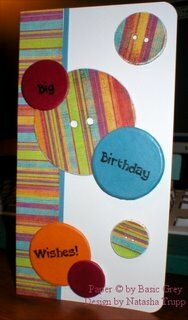 I used a circle cutter to cut out a 3 inch circle, then I used my corner rounder. Carefully remove the base (the corner guide), then pick a starting point on the circle. It takes a few punches to get the hang of it, but once you know how to line it up, it's actually quite quick. This also works for straight edges, that's actually easier. 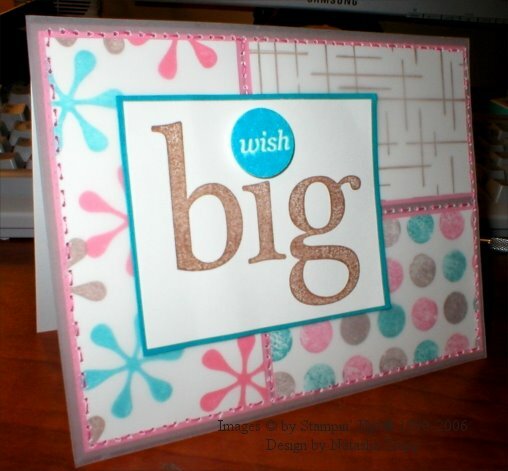 I'm in the middle of making a card with a scalloped bottom, look for it tomorrow! Well, it's no longer Sunday Morning, but I did make this early today. I saw this gem by Vera at SCS (Country Blessings Shoebox Swap) and was immediately inspired. I love the look of the ghost stamping. I used a different autumn leaf set, and I do not have a spectrum pad, so I sponged,swiped, and blended the same colours. 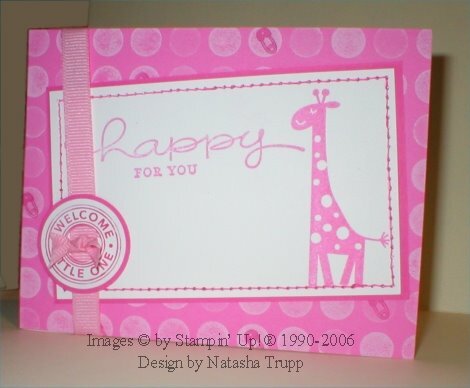 I also added an acetate overlay stamped with the "friend" stamp from Lexicon of Life. I went to a local scrapbook store today. I picked up a package of the Basic Grey Hang Ten papers. I checked the price, then sadly set them down. The saleslady comes up to tell me, "that's the last package, it's 50% off! ", so that changed my position on them. I also picked up some other Basic Grey papers, from the Gypsy line, and some Wholy Cow rub-ons. I hadn't used those before, not sure why, because they are so cool and so easy to use (that's a later project, maybe for here tomorrow). Anyway, so with new Hang Ten papers in hand, it only seemed appropriate that I use the Do The Hula set! I also used the greeting from It's Your Birthday (the one with the aged font look). The paper that the surfboards are stamped on was soaked in an ink-water bath. Then, while it was still saturated, I dribbled a few reinkers on it. Because the paper was so wet, the reinkers floated around nicely which ended up producing kind of a backwards tye-dye effect. I felt like making something this morning. I watercoloured the leaf in the label last night, and didn't know what to do with it then. However, this morning, a layout came to me, and this is what I made. 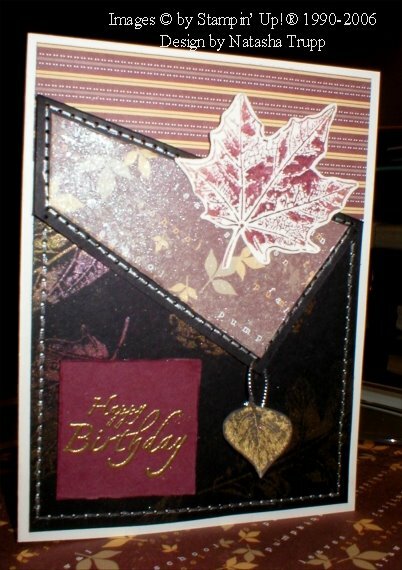 It's funny, making these autumn cards, we don't even have any leaves in our yard. We are in the midst of this crazy wind storm ( I don't really know what to call it), so our tiny trees are leafless, and those few leaves are long gone. 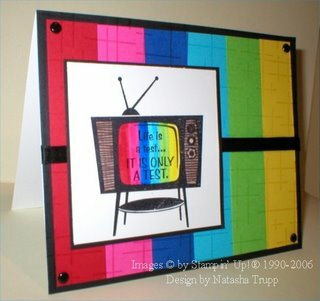 I had submitted this card to a publication, but it wasn't accepted, so here it is! 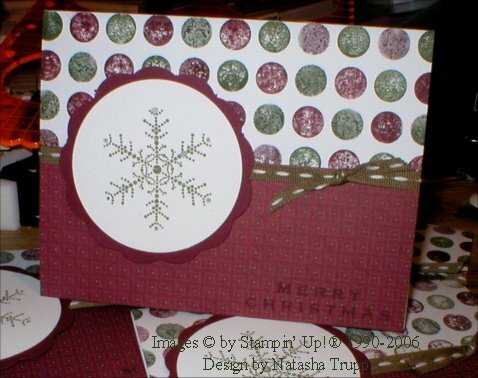 All the circles on there are chipboard covered with designer paper or plain paper. 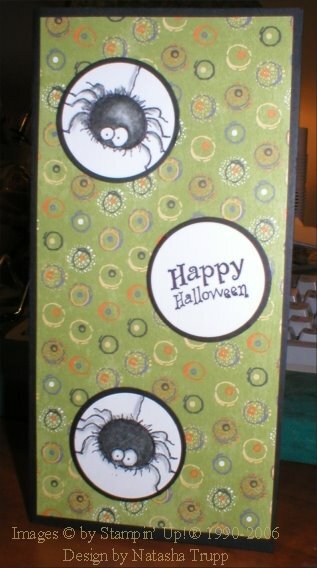 I printed the greeting on textured cardstock, then attached it to the chipboard. I liked the look of giant pretty buttons, so that's the theme I was going for here. This card is quite huge, it's 8 x4. This card was based off of this week's sketch challenge. 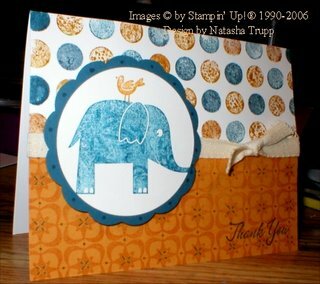 I really liked the challenge because I could see all sorts of neat ways to use different stamps for it. I just made the one card so far, it took a little longer than I intended, but I'm really happy with it. 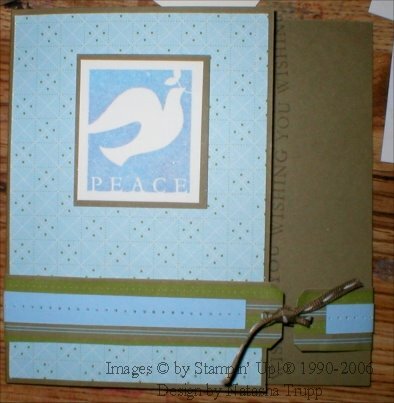 I used faux stitching, distressing, poppin' pearls, embossing and poly shrink on here. The card is actually slightly smaller than the standard size. I started with a scrap piece of decorated black paper, and just cut it while not really paying attention... Oops! So the whole card is about a 1/4 smaller than the normal. The leaf charm is the polyshrink, I stamped the leaf in gold ink than shrank away. 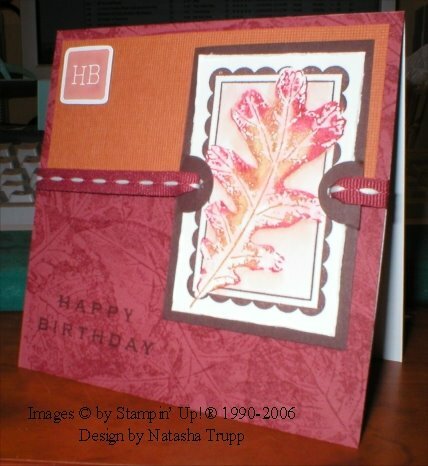 The big leaf is in burgundy with gold ink on the tips, it gives it a lovely subtle shine. I also used the 4 seasons paper on here. I coated the one side with pearlex alcohol spray. I really wasn't feel that into creating anything tonight. It was kind of crazy day at the pharmacy (over 270 prescriptions! ), so I was feeling a little spent. However, the colour challenge was very inspiring. I decided to pull out one of the first sets I got. 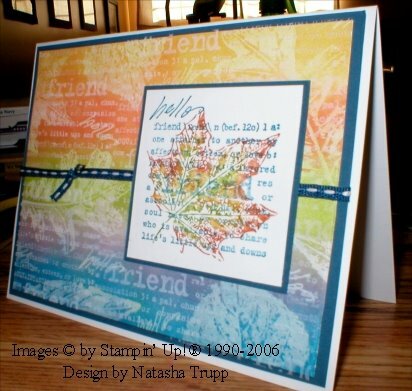 These colours certainly bring a fresh new life to any stamp set. I was looking through my embellishments, and noticed that not only do these rhinestones match 2 of the colour challenge colours, but they are also the perfect size for the All the Best flower centers! And now for something not directly stamp related... I almost always have the itunes blasting in the background, so I thought I'd share my incredibly eclectic top ten songs (can't say I didn't warn you!) that are my favorites right now. I would love to hear your top ten music list for stamping to! Way back in April or May, I got this hostess set. I specifically chose it because it wasn't my typical style, so I really like working with it and trying to produce cards that stretch my usual pattern of creativitity. This one was inspired by the technique challenge at SCS. The technique was to use dots of colour like Monet paintings. The method to this technique was discussed, but it didn't really work out for me, so I just went with a general Impressionist painting look. I saturated the image with water, then went in with the crayons and coloured using tiny strokes. I also used twill tape for stamping on for the first time, and I really like how everything turned out! I had heard about ink bleeding on the twill. I used stazon, and it's good! No bleeding, fading, or streaking! To make the sentiment pop a bit, I framed it with the pewter hodgepodge hardware. 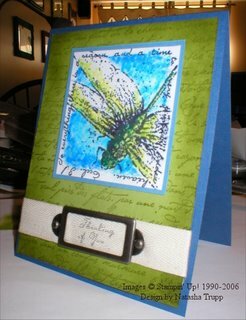 Just a little observation, I was just browsing through the Measure of Life gallery at Splitcoast, and I noticed that very few people use the dragonfly this way. Isn't that interesting? After an evening of eating turkey, discussing tofurkey and turducken, it was only appropriate to bring out this stamp. I received this stamp as a joke a few Christmases ago. I had seen it at a craft store around Thanksgiving and joked about it. It showed up in my stocking the following December. 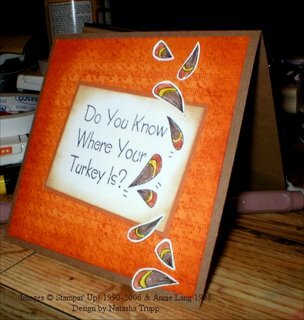 I had also promised my sister that I would make a Thanksgiving card with it this year. Happy Thanksgiving! And even if today isn't the day you celebrate Thanksgiving, it's always a good time to take time and think of things to be thankful for. You remember those hilarious beaded strings that you'd put in your doorway. Well, I was inspired by those for this card. Sometimes, when you make a card, you just kind of laugh the whole time. This is one of those cards. I guess I was just so amused that I took my inspiration from those beaded door decorations. The paper is from American Traditional Designs, Celebrate collection, and the image comes from the After 5 collection. I'm not what you would call a big party-er, but I love the fun, retro images from the After 5 collection. 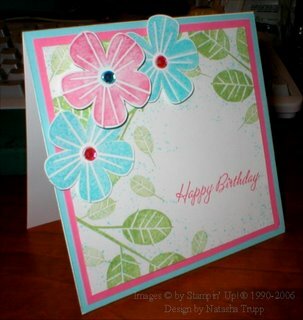 Other items on this card are rhinestones and silver cord. I attached the rhinestones with glue dots. While doing so I was trying NOT to think of the fact that I was using 12 glue dots on 1 card. I know I buy these things so I can use them on my creations, but sometimes you just want to keep it all just sitting nicely in your collection. What's this? 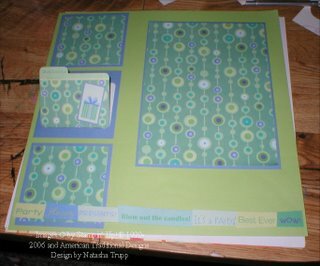 A scrapbook page. It figures, it's takes a proclamation of a "National Card-Making Day" for me to feel like scrapbooking... I don't have the pictures for this yet. I figure, do the layout, then take the pictures. This is a birthday page, so I'll theme it around that. The little file folder will have a little journaled Birthday Wishes wishlist inside. simple. First I made a little 4.25 square donut card. 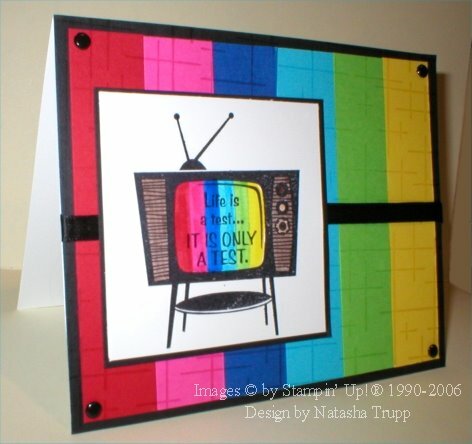 The sentiment is raised on a dimensional and placed on the inside of the card. I didn't originally have the little ribbon staple tag, but the card was begging for something else to make it have that magical design of having odd numbers. I'm still not sure about using staples on cards, but I've tried it a few times and not been entirely unhappy with the results. And finally... I really wanted to use the big ribbon from the Prep School Ribbon Originals set, but it's so big! So I made a pretend bow, tying it in the center with other ribbon. It ended up being pretty overpowering, but I like it anyway. Love the Limited Supply Challenge today. 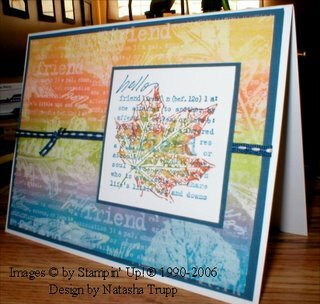 I only recently got the Autumn Leaf Prints set, and I LOVE it, so I love having any excuse to use it. I used several quick techniques on this card. The leaf was stamped using multiple marker colouring/blending, then shadowed with watercolouring. I masked the leaf to stamp the label. 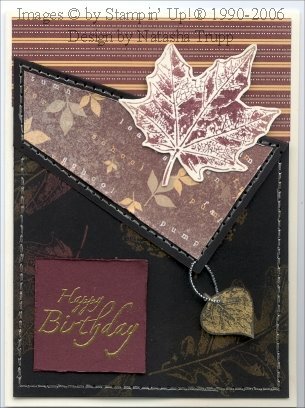 The cocoa layer is a collaged stamping of all the leaves in this set. The bottom is a form of kissing. I inked up Aida Cloth in Sahara Sand, and stamped the oak leaves directly onto the background stamp in chocolate chip. It's really cool how up close you don't notice the leaves so much, but farther away, they really pop. I also used polyshrink to make the little oak leaf charm. I love that stuff for making perfectly coordinated embellishments! For this card I wanted to replicate a style I see a lot with "trendy" mass-produced cards. You know, the ones that cost at least 5 dollars. I wanted this card to be all about different textures. There's the smoothness of the paper, the glossy shine of the button, the fabric of the ribbon, and lastly the dry embossing. 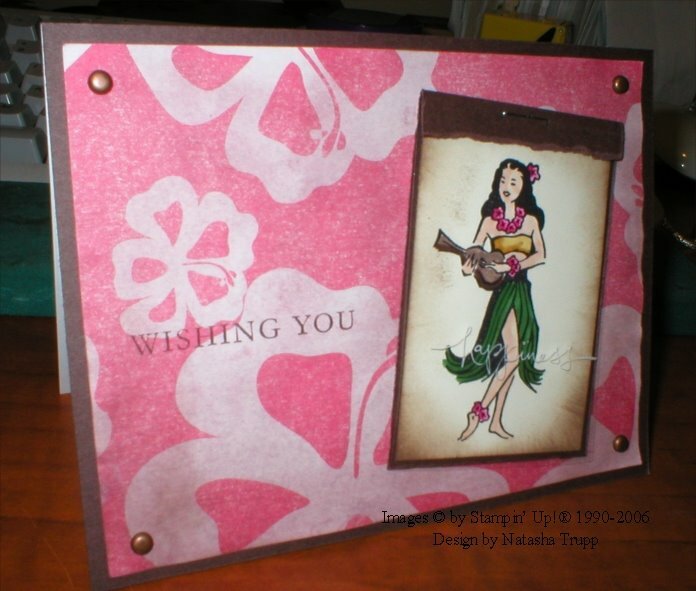 The striped designer paper is covering a slide mount-shaped piece of chipboard. There's a clear button on top of the flower. 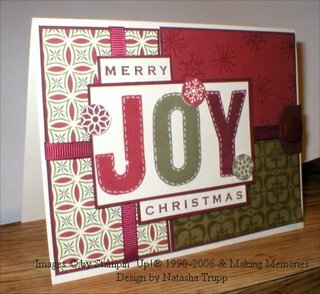 I did the dry embossing to give the slightest illusion of designer paper. I had it plain, but decided to dab on some of the coordinating chalk colours from the designer paper. And to "round" it all off, sorry about the pun, I used the corner rounder to finish it nicely for the bottom corners. This is another relatively simple card, but it's got a fun little twist, it's a belt card. I used the tag punch to make the belt ends. To do this, take a long strip of paper that is more narrow than your tag punch, (this here is 7/8). Bring the piece of paper through the punch until you get to the desired length. Then attached your belt pieces. 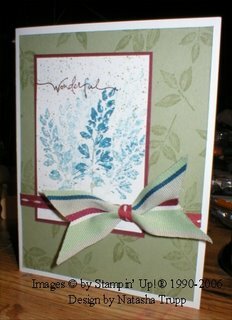 I decorated the designer paper with some pierced bashful blue, and tied the pieces together with some stitched true thyme ribbon. 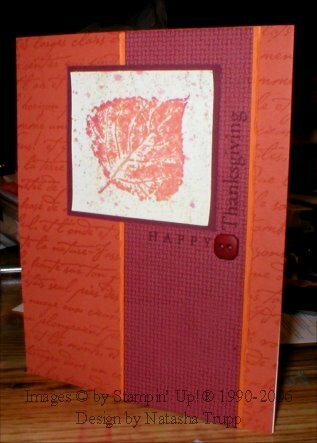 Well, Thanksgiving is this next weekend, and even though I don't usually make cards for it, I thought why not? Here's a nice and simple design. I was looking for interesting ways to use buttons as embellishments. I saw this example in this year's IB&C. The button was used as the corner focal point in the sentiment. For this card. 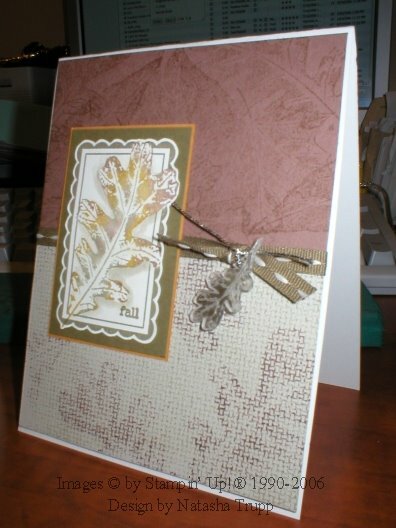 I used the French Script and Aida Cloth Backgrounds, as well as the Autumn Leaf Prints set. I rock'n'rolled the leaf in rust then in burgundy, and then misted it with water. I stamped that onto vanilla, and misted the paper. Then I splattered some ink over top. 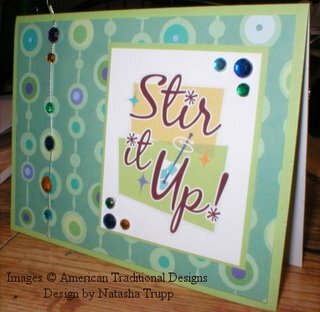 Just a word about doing the focal corner embellishment, stamp the entire saying first! I had stamped the "Happy", then almost glued on my button. Don't do that, as it makes using the stamp-a-ma-jig nearly impossible. Luckily I caught myself, and so I put the button on the side, marked its location with an x, and then stamped the "Thanksgiving". There is also some distressing on the pumpkin layer beside the aida cloth burgundy strip. Wishing You... (you guessed it) happiness! Anyway, here is the creation of tonight, I did some things I hadn't done before, like age my own paper. I soaked some designer paper in water and Close to Cocoa reinker. It gave exactly the effect I was hoping for. The hula lady is coloured in with markers, I sponged a bit around the sides, using the inward swiping motion, and it's hard to see, but over top of the hula lady is a piece of acetate with the word "happiness" in white stazon. The inspiration for this card came from Valerie Stangle on SCS. I loved her pairing of the Do the Hula with the Happy Everything set. I really love using Do the Hula because I love having an excuse to use bright colours. I'm not usually a fan of tearing or staples on cards, but I felt like it really worked here.